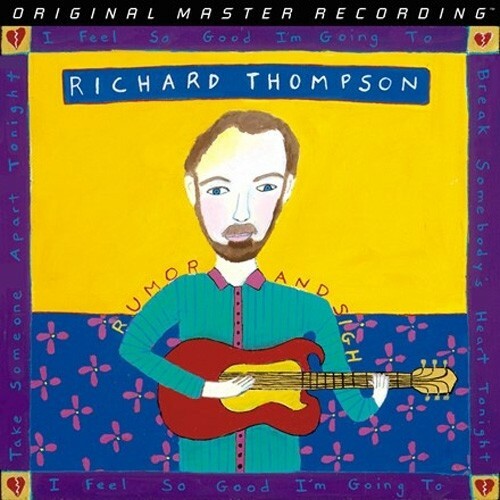 The Most Cohesive and Accessible Album of Richard Thompson's Career: Brilliantly Diverse, Savagely Witty Rumor and Sigh Includes All TIME 100 Song "1952 Vincent Black Lightning"
Richard Thompson manages all of his usual superhuman feats on Rumor and Sigh. Rippled, vibrant guitar lines that sound like they're coming from four guitars? Check. Lyrics that expose the delicate quirks of human behavior in witty, truthful manners? Here. Engaging vocals that arrive as if they are sung only to you, the words doubling as whispered thoughts in your own head? Yep. But Rumor and Sigh goes further by featuring astute, lively production and well-planned arrangements ranking the 1991 album as one of the – if not the most – cohesive and accessible efforts of Thompson's storied career. And now, courtesy of Mobile Fidelity, it's his best-sounding record. Mastered from the original master tapes and strictly limited to 2000 numbered copies, this hybrid SACD breathes with an effervescent openness that makes the music emerge with a livelier sheen, standout dynamics, and unstoppable energy. This definitive digital edition makes it immediately evident Rumor and Sigh ensures as a very special album – a cohesive, varied, and fun set spiked with some of Thompson's finest compositions and an exoticism that extends to the modest use of the hurdy-gurdy, mandolin, concertina, and crumhorn.